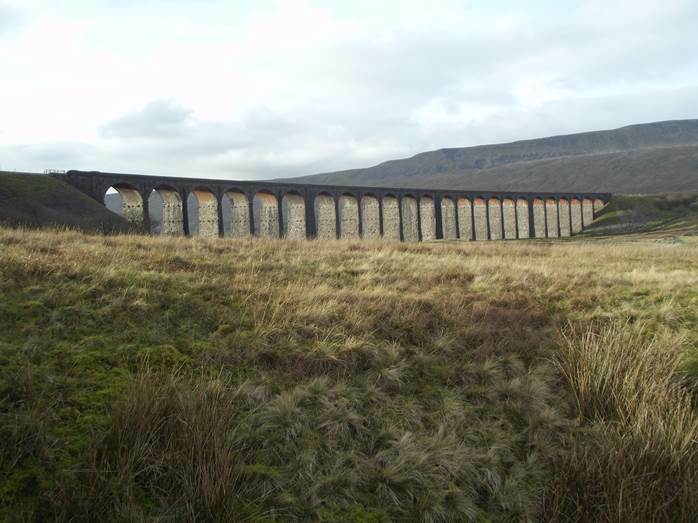 The Ribblehead Viaduct is one of many huge engineering structures on the railway between Settle and Carlisle. Let’s deal with history and facts first. 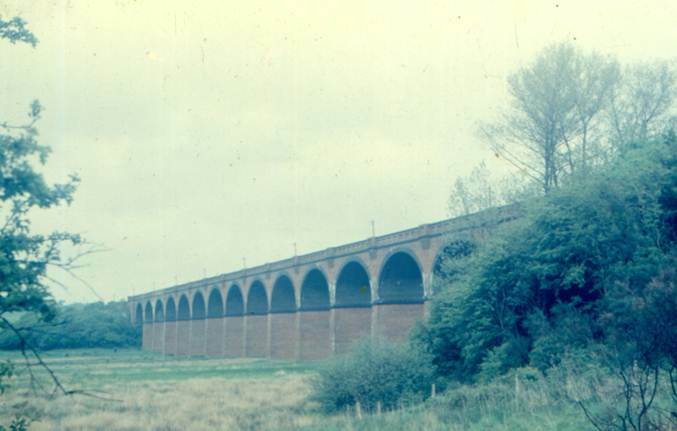 Construction started in 1870 and the viaduct was completed in 1874. 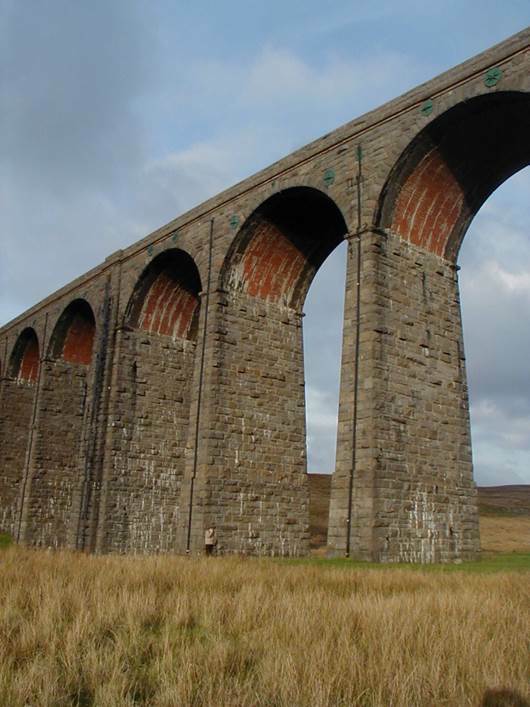 1000 navvies worked on it and three separate shanty towns were formed on Batty Moss which the viaduct crosses. 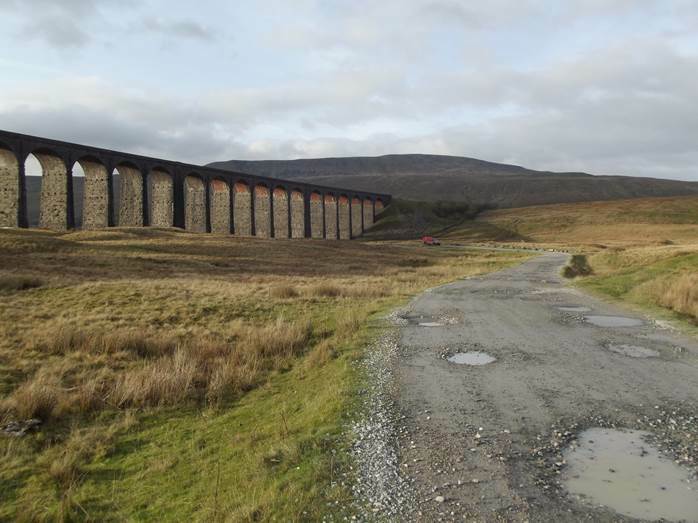 The Ribblehead viaduct is fully a quarter of a mile long and 100 feet above the valley floor at its highest point. That’s roughly equivalent to the height of a 10 storey building. 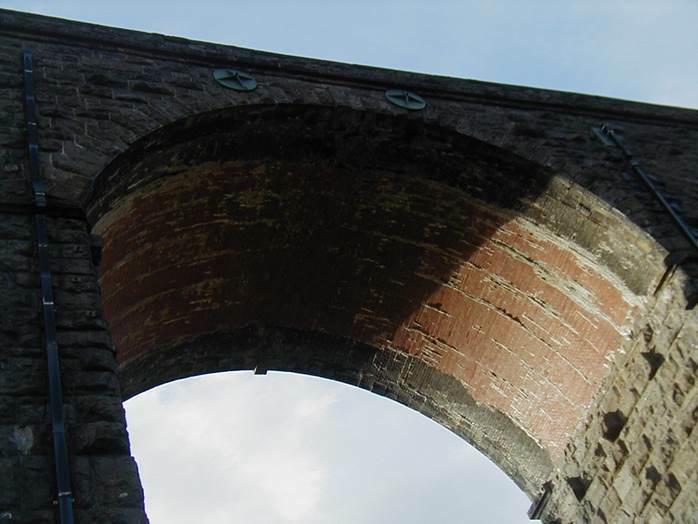 There are 24 arches made of the most readily available material which was the local limestone. The foundations are 25 feet deep. The viaduct is not level. The north end is 13 feet higher than the south end. At least 100 navvies were killed during the construction. 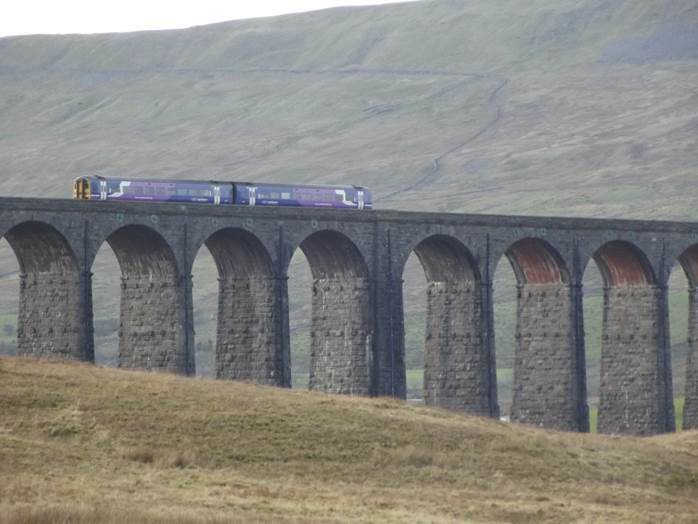 To give an idea of the terrain, travellers on the line pass over the viaduct and very soon plunge into Blea Moor Tunnel. This is a mile and a half long and in places 500 feet below the land’s surface. But back to the viaduct. 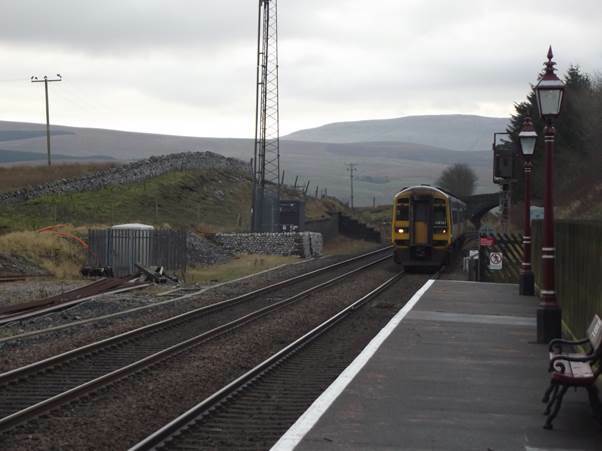 We travelled over it by train and alighted at Ribblehead’s remote station before taking a look from ground level. 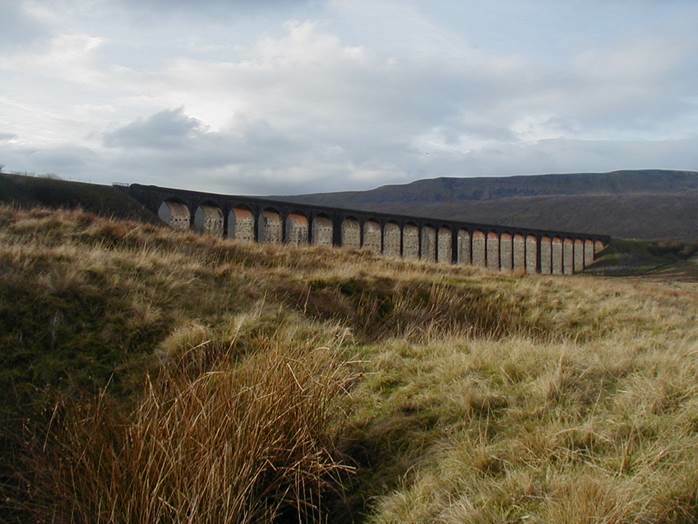 There is the viaduct with Blea Moor beyond. You need to remember this is a quarter of a mile long to get an idea of how huge it all is. You get more idea of its enormity when you see just a part of it. The post van approaches. 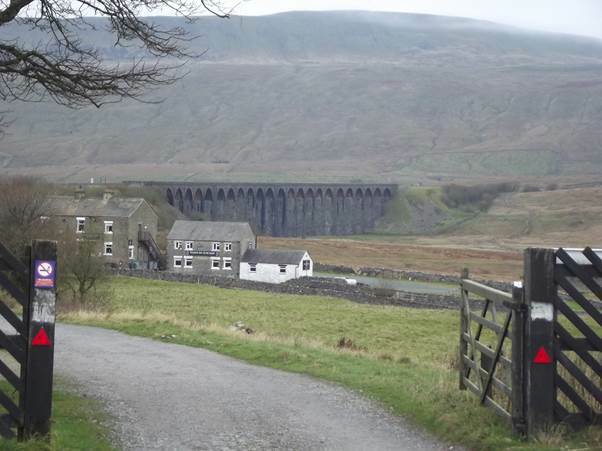 The track leads under the viaduct and to some isolated farms. The site of the shanty towns is a scheduled monument. It is hard to imagine that there was once an engine shed here as well. Oh, and a brickworks for the tops of the arches. My wife provides a bit of scale. The stone pillars are enormous. The workers who toiled to get the viaduct opened in 1875 are commemorated alongside those who saved it in 1991. That’s me by the base of one of the arches. Trains still cross the viaduct. 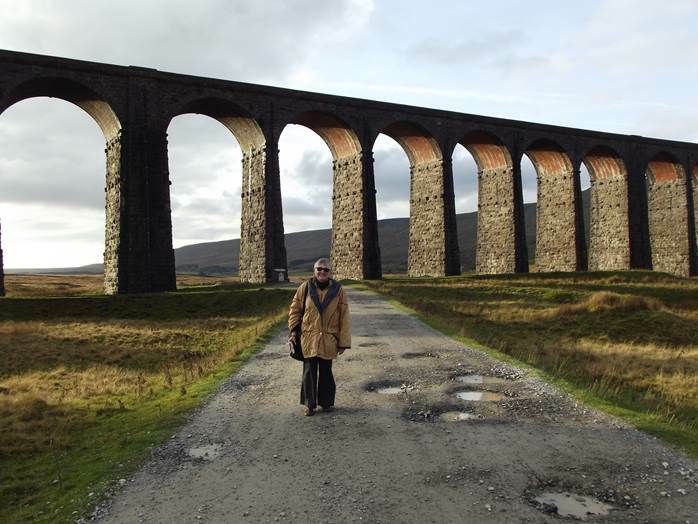 I, of course, think this viaduct is magnificent. 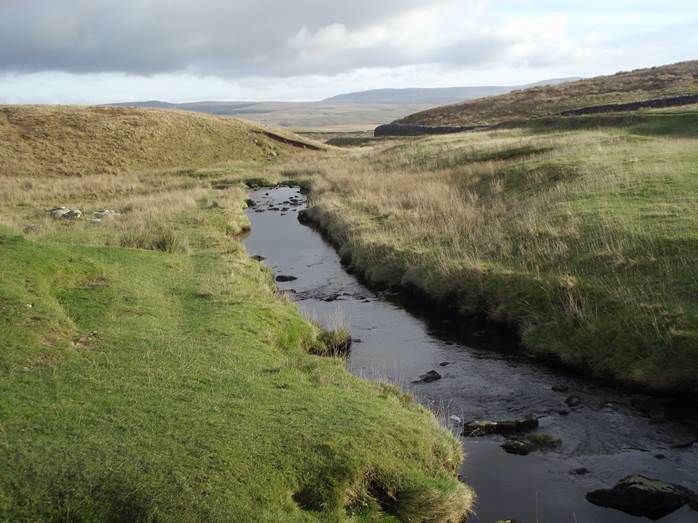 It is made of the moor it crosses and adds to the scene rather than being a violation. That it was built, back in the 1870s, was surely a mistake. But that it survives is surely even more wonderful. This is a post about a railway line but keep looking for I shall say very little about things technical. Trains will feature only as adjuncts. Above all, the stretch of line I travelled is utterly beautiful. As a personal opinion, I should say it was a line that should never have been built. It was designed as a third competing route for traffic between England and Scotland. It traversed incredibly difficult areas and served parts of England which, then and now are totally devoid of population. 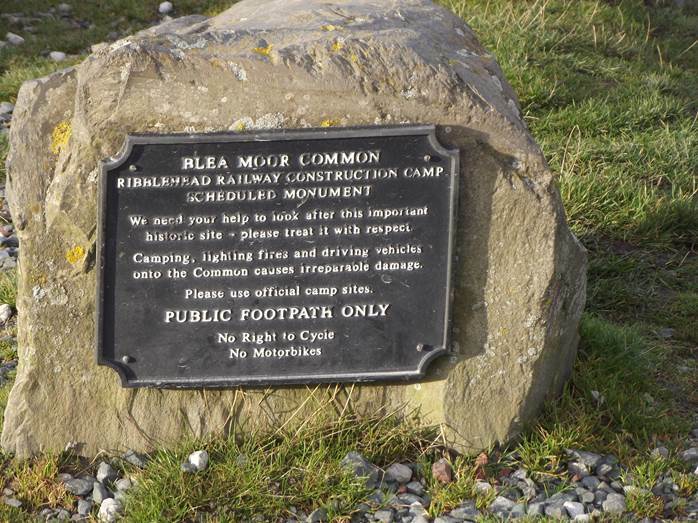 But let’s be glad it was built and let’s be glad that such locals as there were fought long and hard against plans for closure and in the end, 25 or so years ago, they achieved a wonderful victory and the line was saved. Remote stations were rebuilt and reopened. These days the line seems vibrant and is wonderfully friendly. On one journey on ordinary service trains we got a feel that staff love their line and they have every right to. Travelling on some of the line was a birthday treat for me. 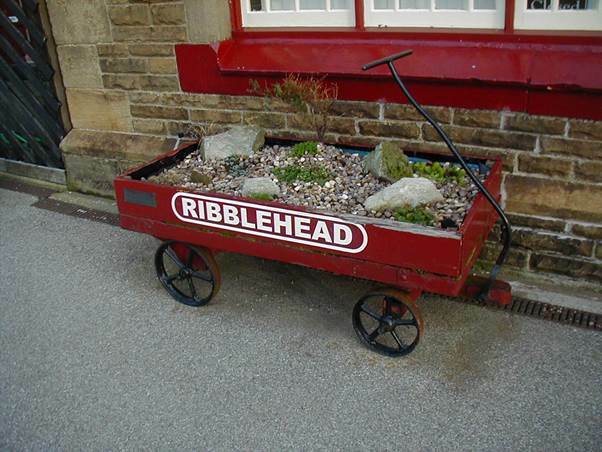 We decided to board the train at Ribblehead. 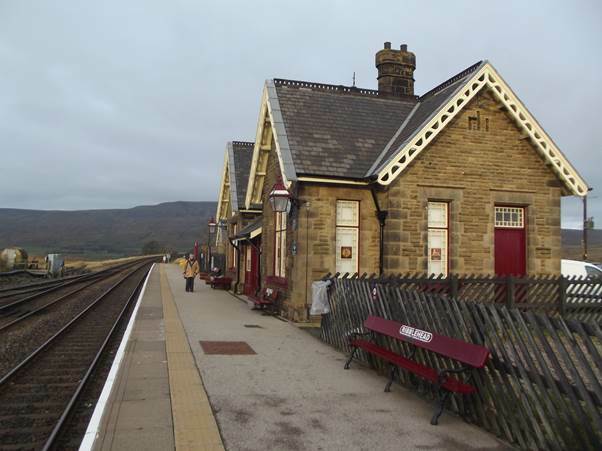 One thing you’ll note is a complete lack of housing although there is a station house, a pub and a cottage or two. This is the station. There’s a logging siding on the right and I guess this is why, when the station re-opened the down platform was moved a bit up the line. You’ll note, I hope, that the station is spotless. In fact it has the feel of a station on a heritage line, but this is actually a main line with suitably fast trains. There’s a railway milepost on the wall of the station. 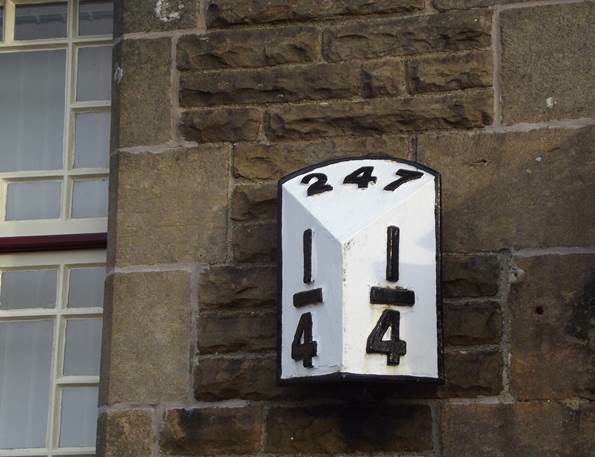 We are 247 and a quarter miles from London. 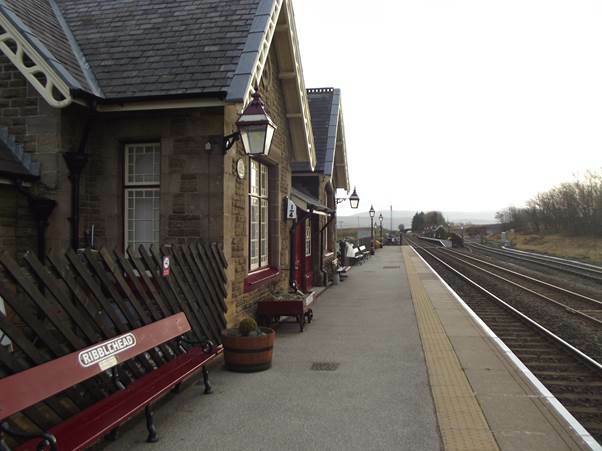 Lovely scenery – and a complete absence of houses – surrounds the station. An old station barrow has been converted into a garden. I love the waiting room windows. From the station entrance you can see the viaduct, The Station Inn and some three storey cottages. Our very ordinary train arrives. We are taking a journey to Appleby. The railway came late to my parish. It didn’t open until 1900. Often, the most recently built lines were amongst the first to close. Our local line, though, is now the main line between London and south west England. Dr Beeching, and his political masters did close the local station, but the line carries quite a heavy traffic these days. 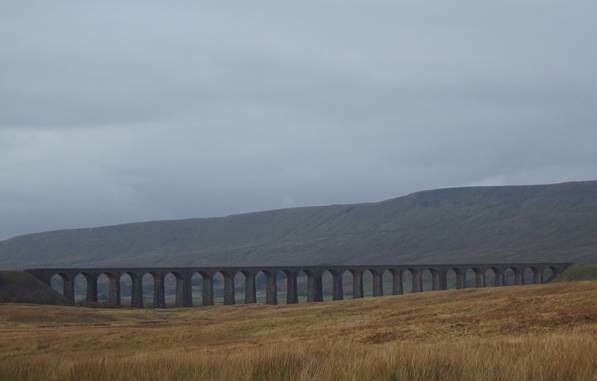 But take a look at that viaduct. It is made of brick – millions of them. 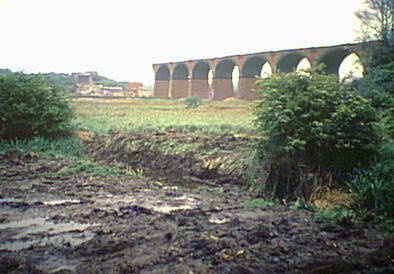 The viaduct proved a boon for the local brickworks. The local economy was boosted considerably by the building. 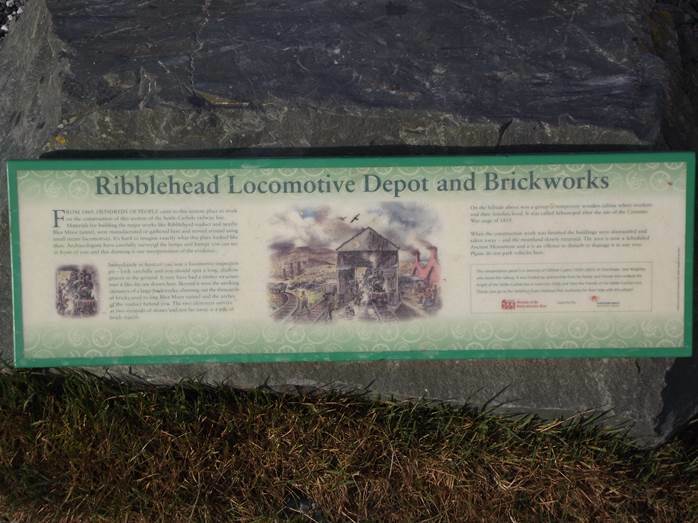 Building the line provided all sorts of employment – there was plenty of earth to move requiring navvies and many other jobs – bricklaying and also carpentry and more technical jobs. If local men could get a decent wage working on the line it meant wages had to go up for other jobs. And of course, more money in the pockets of workers means more money gets spent locally. The added wealth filters through. There may have been another local advantage, albeit it may not have seemed advantageous at the time. Travelling navvies moved into the village. Some stayed. These incomers broadened the gene pool which will have helped to maintain a healthy population. 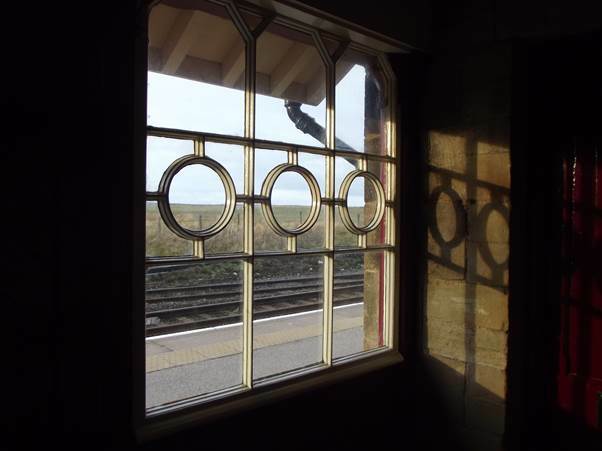 One of the things I like about railways is the social history – the way the new development impinged on the lives of ordinary people – even those who never travelled by train. It isn’t all about old steam locos, although I do love them too. This could be another story of a French bridge, for the railway viaduct at Morlaix is, in my eye, a magnificent structure. It strides across the Brittany town and appears incredibly lofty. 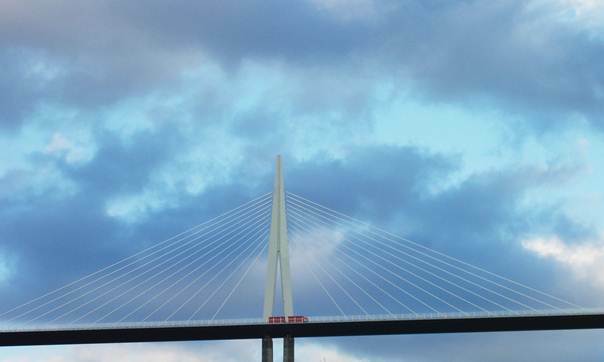 Its actual height of 62 metres makes it a mere baby when compared with the Millau Viaduct but then Morlaix dates from the 1860s. 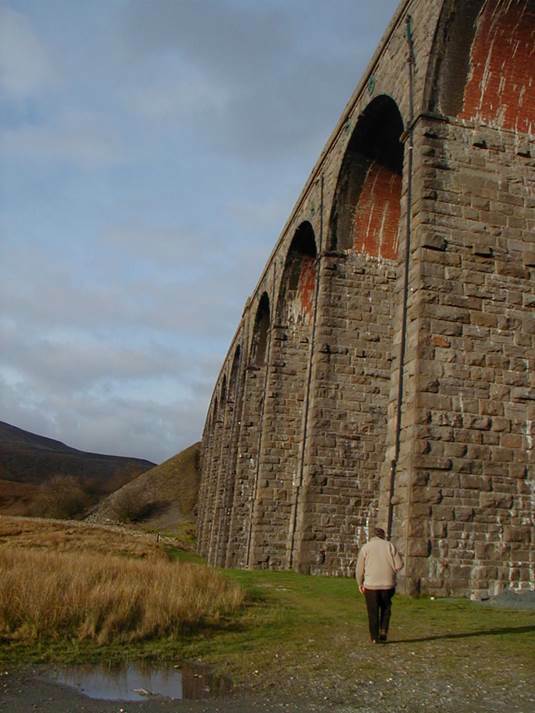 Anyway, I was there on 1st August 2002 and here’s the photo of the viaduct. 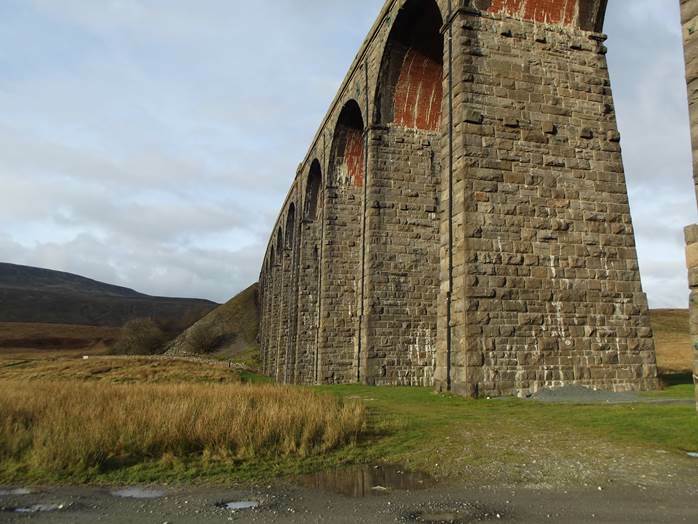 But the viaduct lost my attention as my ear heard the distinctive sound of live steam at road level. First one, then a couple and then a whole collection of steam cars drove in to Morlaix and parked up in the town. This one dates from 1910. It was an unexpected and unlooked for pleasure to chat with the enthusiasts who owned or drove these lovely vehicles. But let’s not ignore Morlaix. It’s a lovely place. 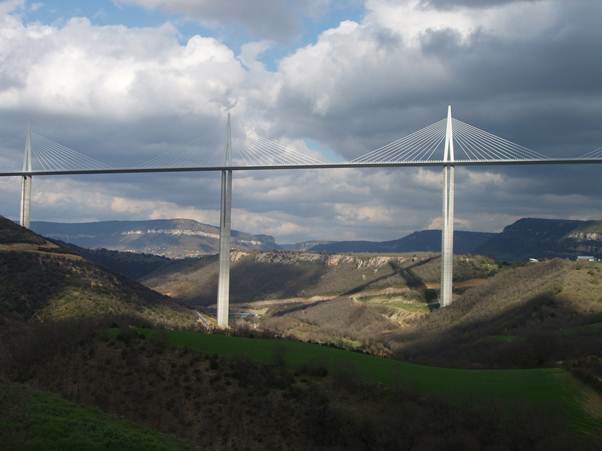 This bridge is famous for being the tallest bridge from valley floor to top of pillars anywhere. 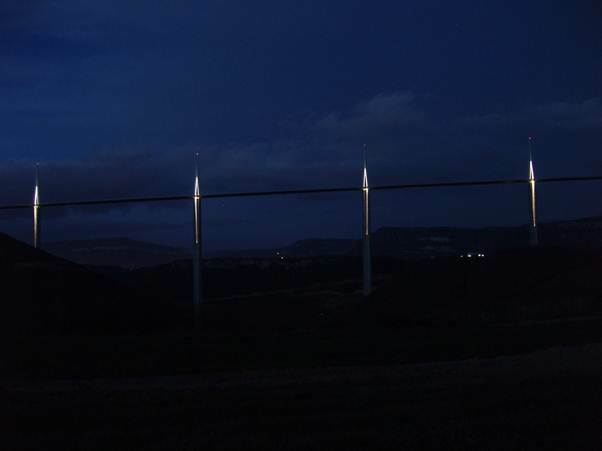 As Rolf Harris said when painting (almost), ‘do you know where it is yet?’ Yes, it’s the Millau Viaduct which opened to traffic in December 2004 and was about 15 months old when we were there. In 2006 we were heading to the south of France and phoned a potential B and B stop. The owner kept referring to a viaduct which we would see. We should have known what it was, but we were taken by surprise by the sheer scale of the thing. The word we used to describe the ability to plan and make such a structure was ‘audacious’. That still seems the right words for this elegant, wonderful structure. Even from a distance, you can’t get all of it framed in a camera. 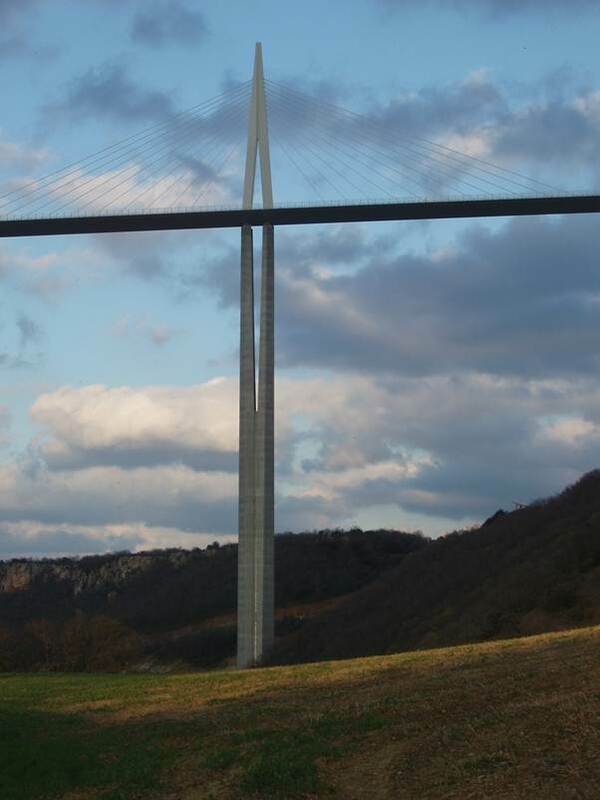 It is altogether a hugely tall bridge. 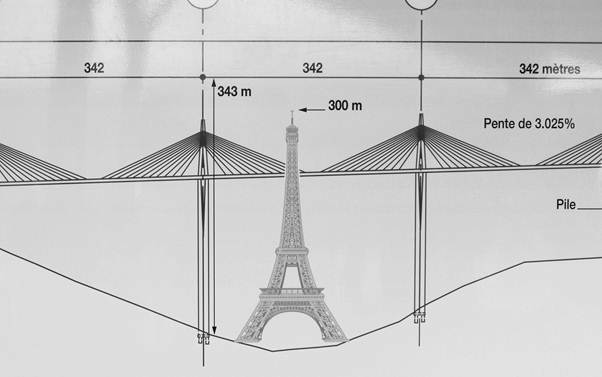 Those are the tall pillars and you could all but fit the Eifel Tower underneath the roadway and up to the top of the suspension towers makes it higher than the famous Paris landmark. For those with a need to know, 343 metres is about 1125 feet or nearly three times the height of the cliffs at Beachy Head. 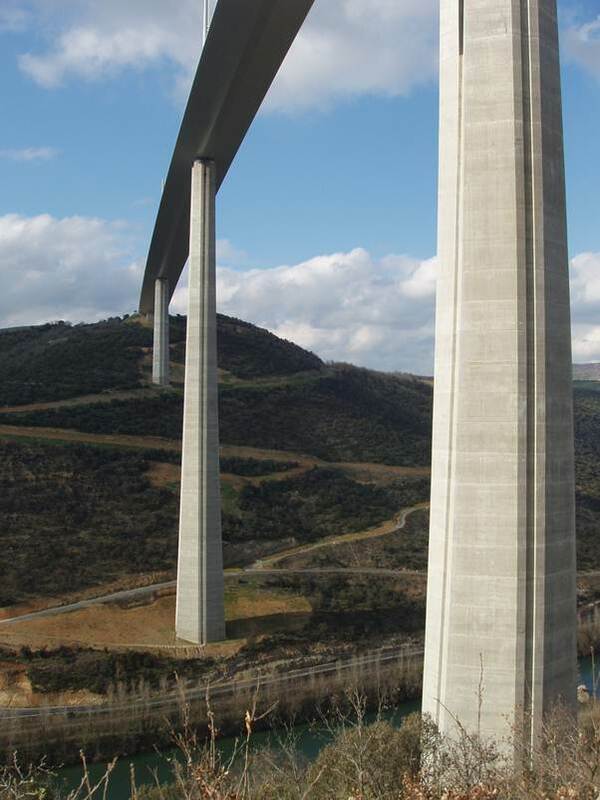 High above a huge lorry and trailer can be seen on the Millau Viaduct. It really is an amazingly elegant structure. It looks good by night as well. 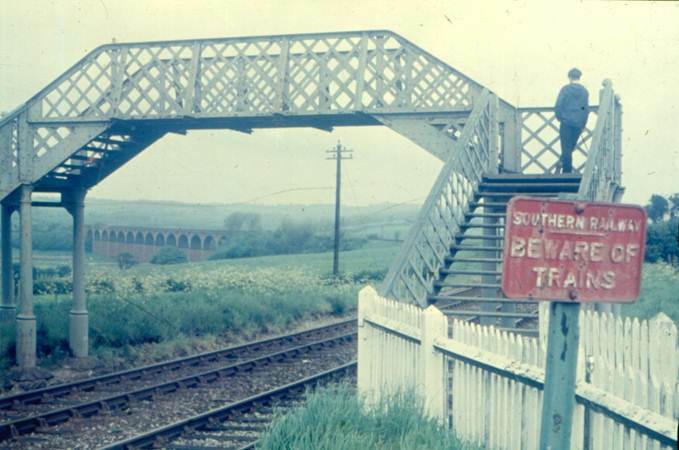 My dad was born in 1919 within sight and sound of the Bexhill West branch of the South Eastern and Chatham Railway. 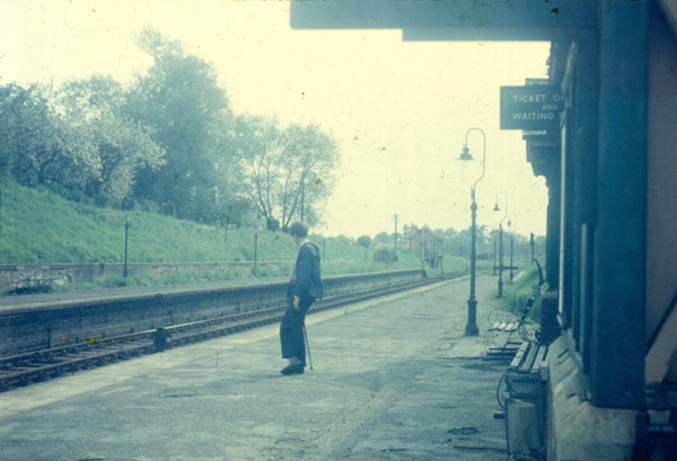 He wouldn’t really have had memories from before the grouping, but he told me he used to get confused about why people sometimes referred to Bexhill West as ‘the South eastern station’. He also commented that he knew people who had built the line, something he thought almost impossible since railways had clearly been there for all time. In fact, the line opened in 1902, just 17 years before dad’s birth. 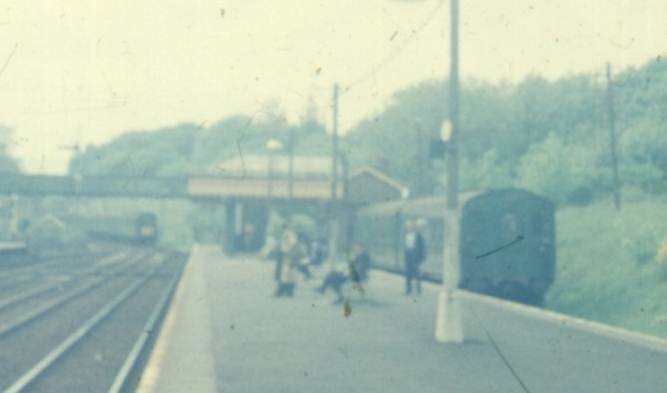 In 1964, Dr Beeching had the line earmarked for closure. My dad decided he wanted to take a nostalgia trip along the line. He remembered ex Brighton D3 tanks as motive power, with the Westinghouse donkey pumps providing air pressure for the train braking system.. By 1964, a 2 car Hampshire style diesel unit provided the motive power. Let’s start at the only intermediate station between Bexhill West and the Tonbridge to Hastings main line at Crowhurst. That was Sidley. We appear to be the sole passengers waiting for the train. That’s me, resting on Dad’s shooting stick and clearly wearing some trousers that didn’t like my shoes. I bought a platform ticket as a souvenir. It is dated 21st May 1964. 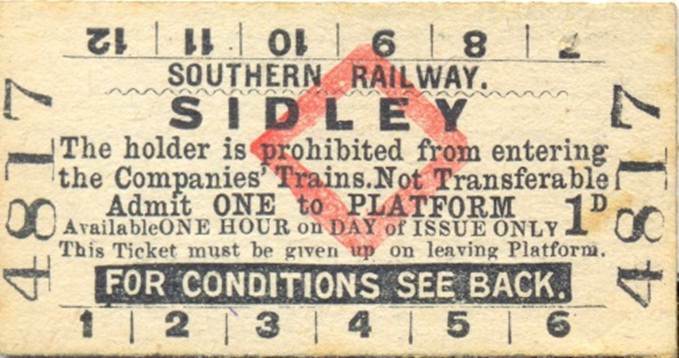 The ticket I was given, however, had originally been printed earlier than that for it is a Southern Railway ticket and says it cost 1d – an old penny. 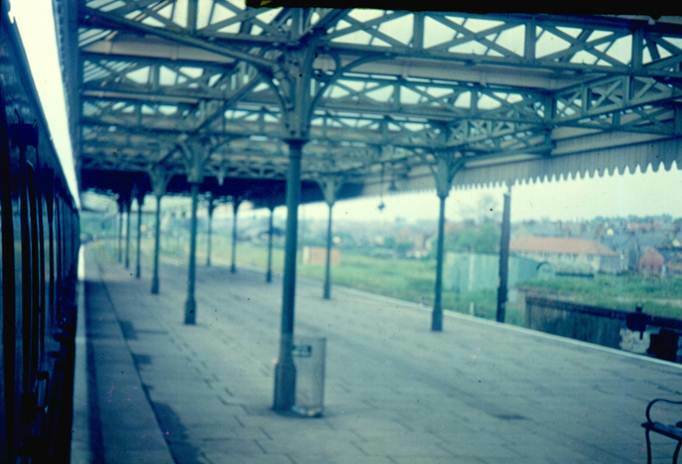 Sidley was the nearest station to the flats where my dad was born and brought up. 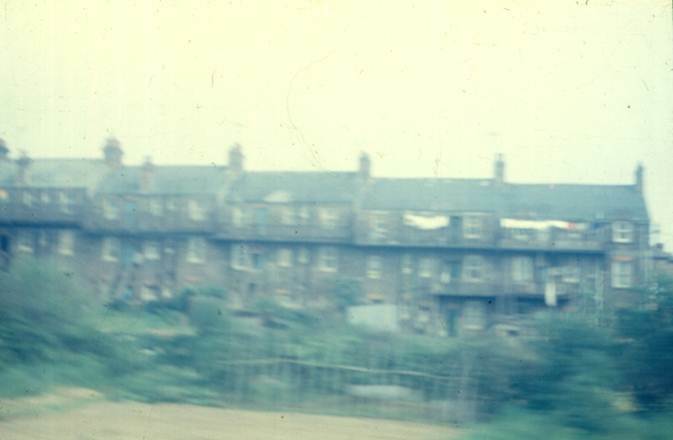 He took a photo of the flats from the train. The quality is awful. Yep! That row of unprepossessing flats is where Dad was born. He could see the trains from the back windows, just as we could see the flats from the train. It’s now 48 years and a bit since we made this pilgrimage for Dad. I cannot remember precisely what we did – except that we went to both ends of the line. Let’s see Bexhill West first. There’s the two car diesel unit on the left. It ran the shuttle service between Bexhill West and Crowhurst. Hopefully, you didn’t wait long for a train from Hastings for the onward journey. Bexhill West looks far too grand. Perhaps it was never a sensible line to build, for the rival Brighton company already served Bexhill. 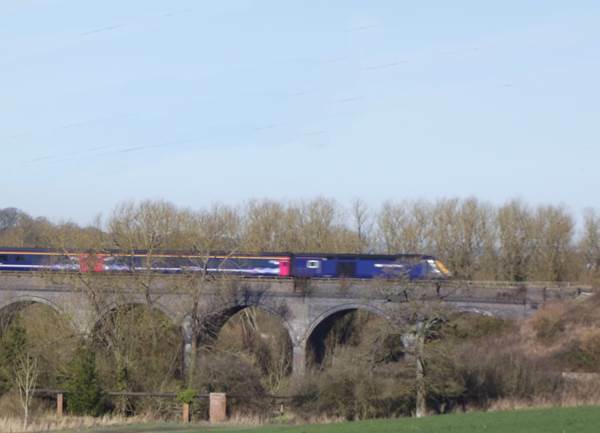 About half a mile from Crowhurst, the line crossed a little stream and this meant a large viaduct was needed. We went to look at it. 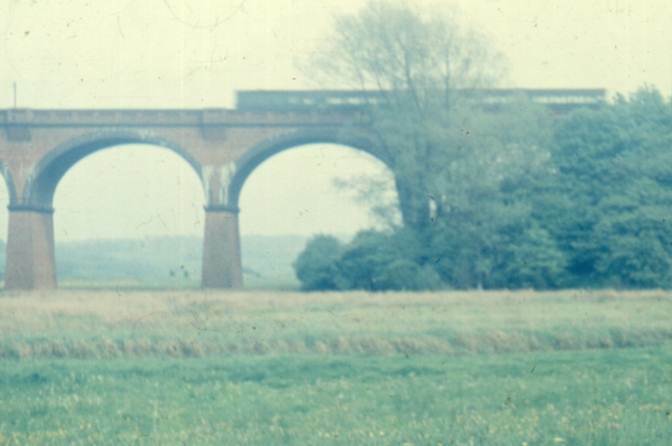 Dad managed a none too good shot of the Bexhill West train passing over this structure. There’s an altogether sharper shot of the viaduct. The Bexhill train is on the right, with a Hastings bound train, from London, approaching. 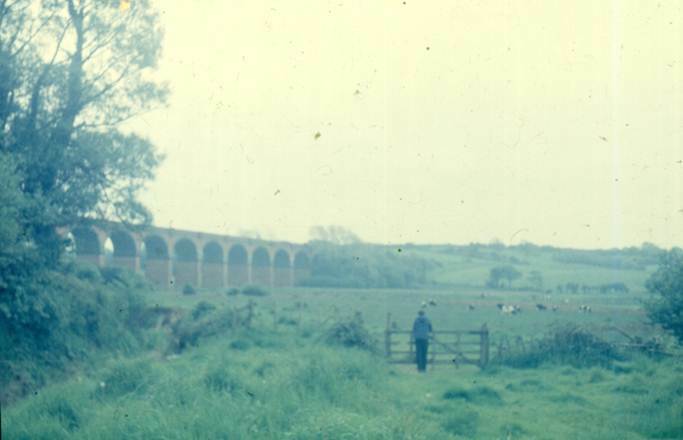 Gosh.Dad was almost artistic here, framing the viaduct under the footbridge and organising a lad (me) to stand, casually, looking into the picture. 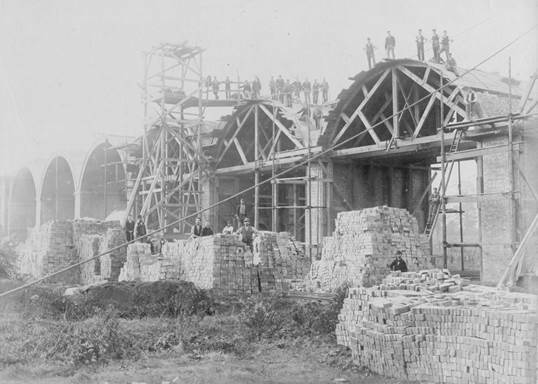 Crowhurst viaduct was blown up, as captured by a newspaper photographer. 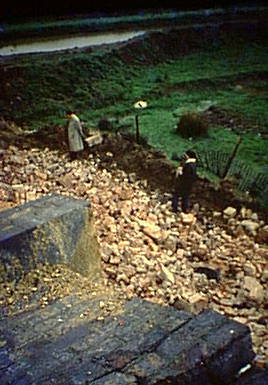 We visited again in 1969 with half a demolition job done. This time I was the photographer and I grabbed a photo of Dad on the rubble. He’s in the white coat.